The transfer from San Marco to the airport was actually a very nice way to end the trip. The 1.5 hour boat ride was like a bit of a tour in itself. The boat drops you off at the airport pier and it’s a 7 minute walk to the terminal. Checkin with Transat Holidays was very smooth and the flight home was amazing. Again, I recommend the Club Class seats for the extra room, comfort, meals and exceptional service. The flight attendants were extremely attentive and friendly. The only problem was that we ate too much. Four movies later and after a smooth flight and we arrived back in Toronto. We had to overnight in Toronto and it ws actually a very civilized thing to do. While we were tired, we weren’t in that zombie state that we would have been in if we had to tack on another 5 or 6 hours of travel time. Again, something you might want to consider than just the urgent need to get home as quickly as possible. Thank you again for all that have been following our blog. If you have any questions, you can just email me or call me at 934-3400. Thanks and hope you too can experience Greece and Italy! “The way it was, where it was”. This is a loose translation that the Italians use with respect to rebuilding old buildings. 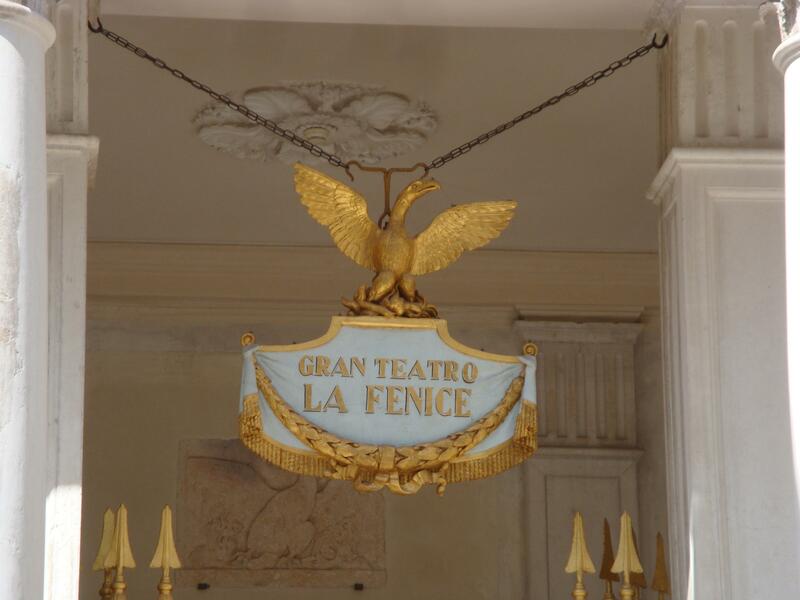 Such is the case with the Gran Teatro La Fenice – Venice’s old opera house. While the initial opera house was built in 1792, it burned in 1836 and then again in 1996. 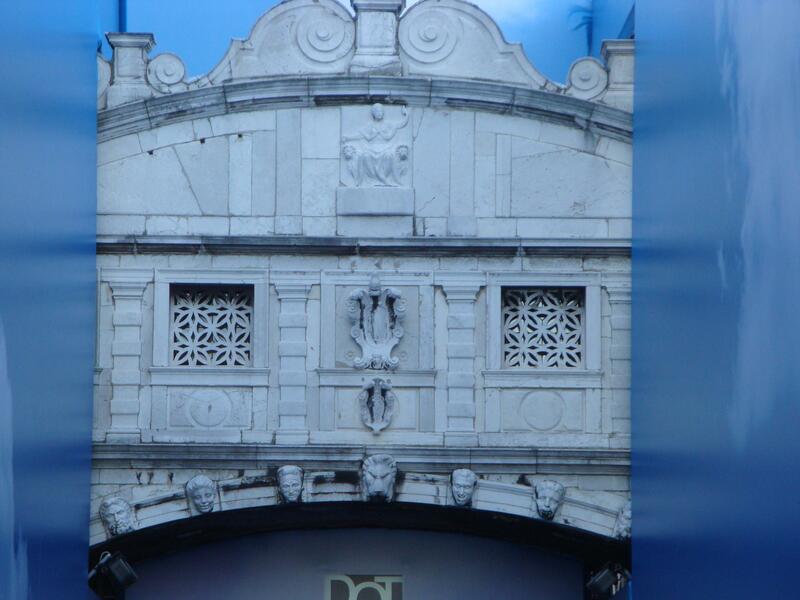 The symbol of the theatre is a Phoenix rising from its ashes and it seems very appropriate. Rebuilt and only opened again in 2003, they have re-created the building the way it was and it is an extremely beautiful and ornate building inside. No pictures are allowed inside the building but the façade, shown below is almost all original. The self guided audio tour is worth making the effort to see this landmark. 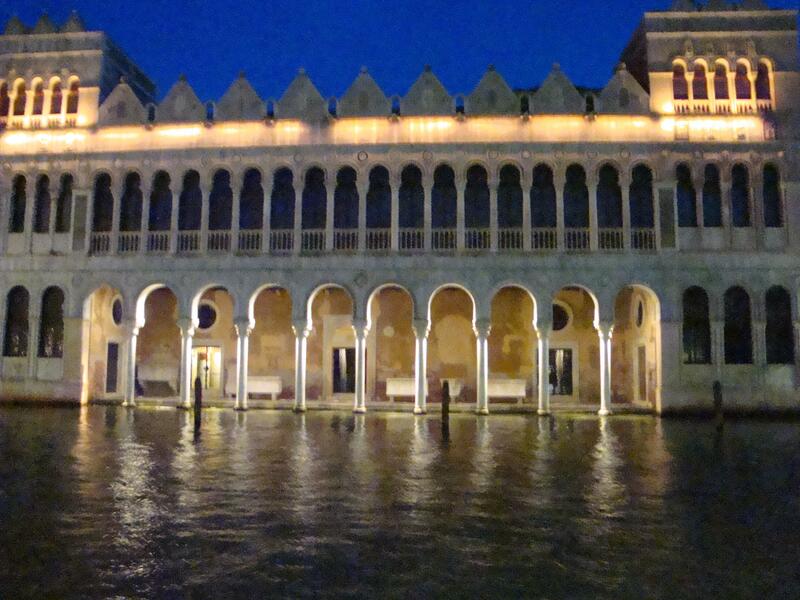 Gallerie Dell’Accademia is listed as one of the top 10 sights in Venice. 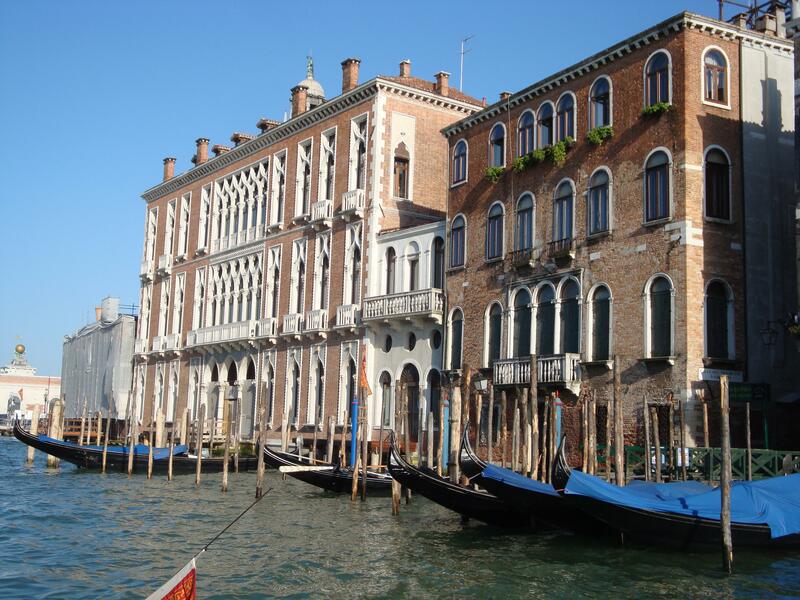 It is an incredible museum of some grand old paintings easily dating back to the 15th century. I’m not a big enthusiast of old works of art but even so, we enjoyed the hour or so we spent there. 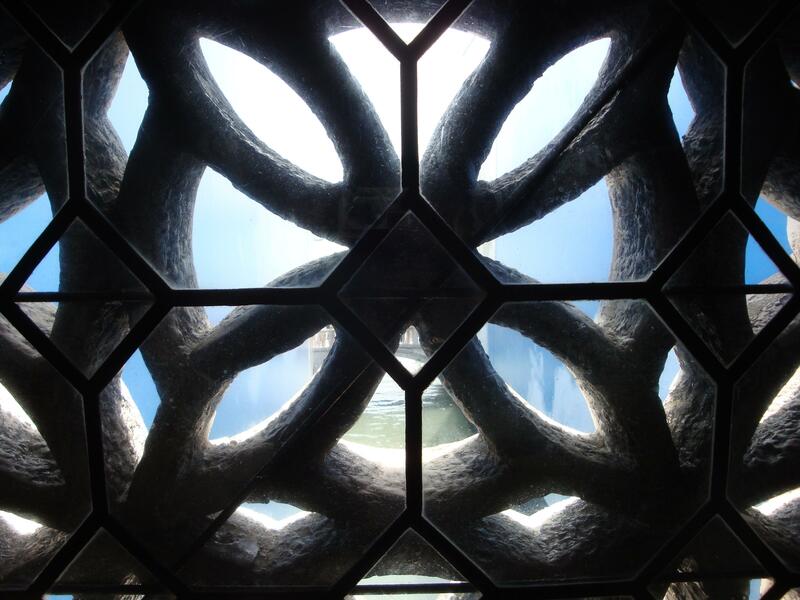 If you love art, plan to spend at least a couple of hours here. 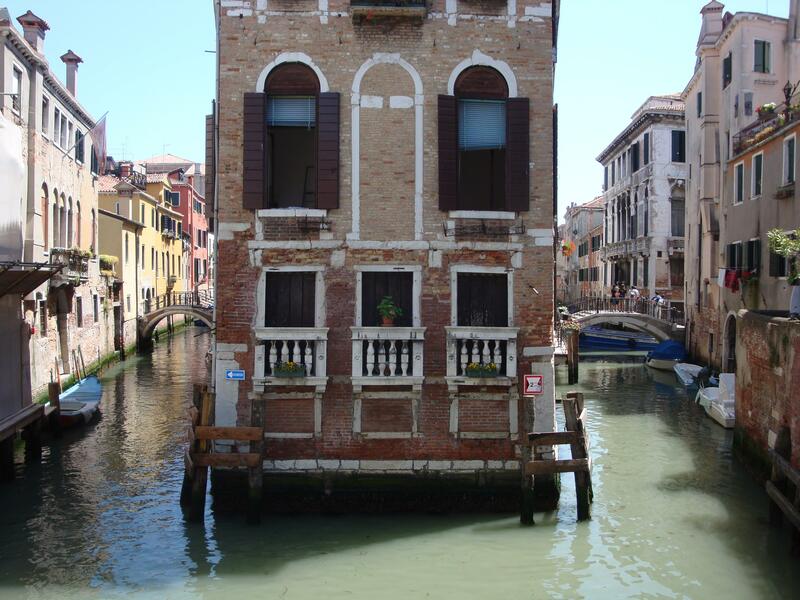 This is our last day in Venice and we are flying out on Transat Holidays tomorrow. As such, this is the last blog of the actual holiday. I’ll do a short entry when we get home to let you know about the flights, etc but I want to thank everyone who has followed our adventures through the blog and hope that it has in some way inspired you to travel to Greece and Italy yourselves! Buona Notte from Italy. Mosquitoes! Have been bitten several times in the last couple of days. Considering Venice was built is a marsh area to begin with, should have known to bring some spray. We decided to tour Doges Palace today. Here’s a hint…pre-purchase your tickets so you don’t have to wait in line. I wasn’t sure that we would take the time to tour the Palace but am very glad that we did…despite the ½ hour wait. It is quite costly to do the self guided tour with entrance fees of 13 Euro each and then the audio guide was another 8 Euro for both of us. However, the tour was a couple hours long and extremely interesting. The highlight was the Bridge of Sighs from the inside on the way to the dungeons. This was the last glimpse of the outside world before entering the prison and it is said prisoners would sigh at their last glimpse. 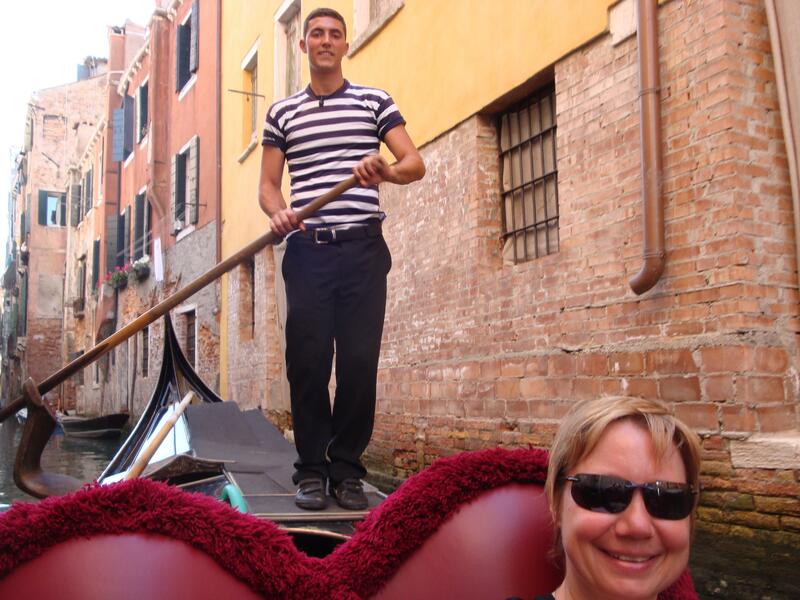 It was a beautiful hot day again today and so, while we were out walking decided now was a good time for a Gondola ride. 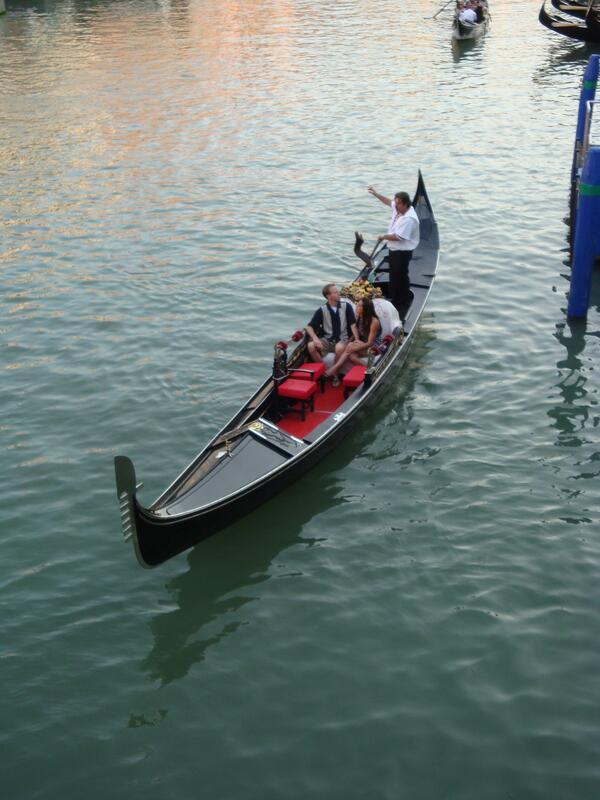 Again, quite expensive at 80 Euro for the 30 – 40 minute ride but a must do if you are in Venice with someone special. 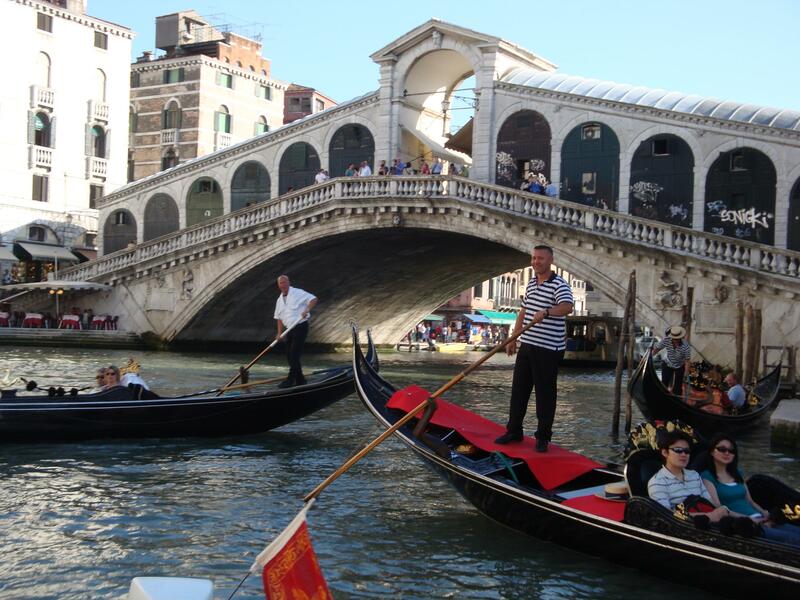 We chose a gondola away from the main crowds because we wanted less of the Grande Canal and more of some the quieter canals. 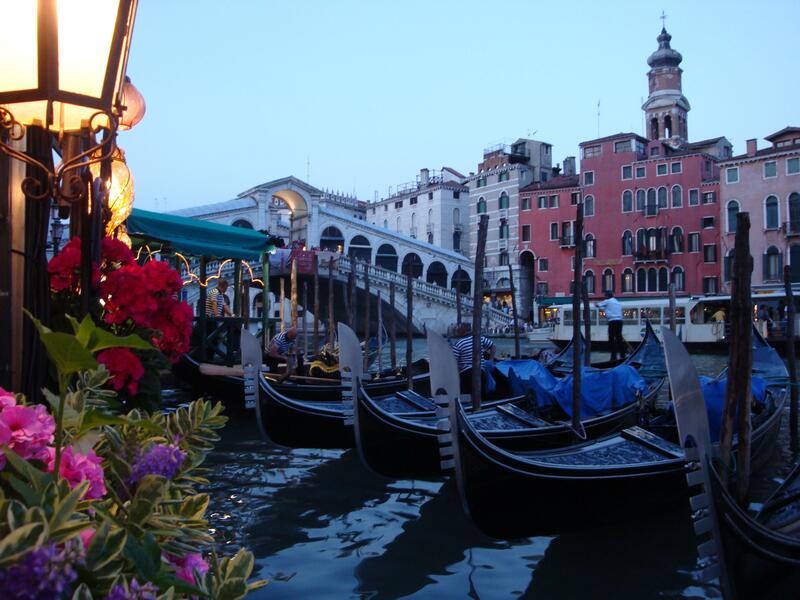 Venice in the spring in a Gondola…what more can I say! 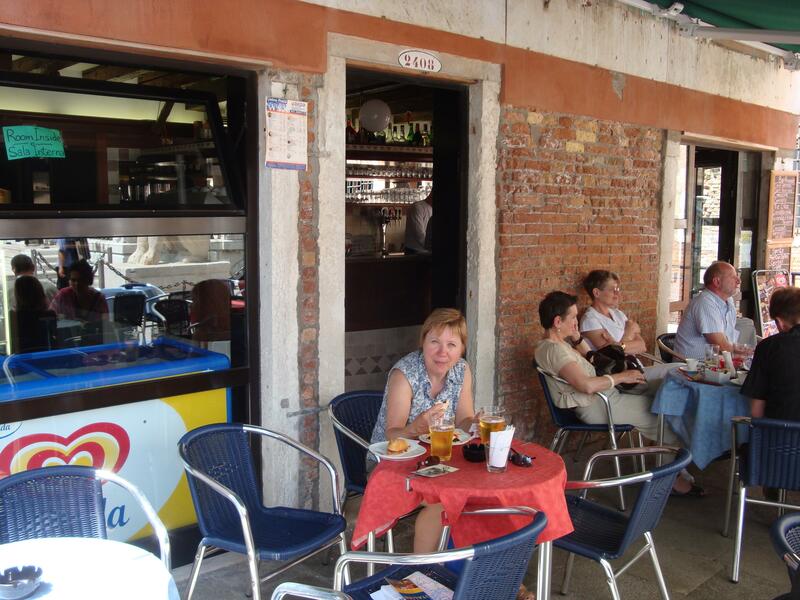 For supper, Karen had read in the book “Chow” (a guide for eating in Venice), that the Al Nono Risorto in the San Croce area in Venice, was a good place to eat. Let me tell you it isn’t. The food is poor quality, it’s no bargain and the staff were not friendly. Probably the worst restaurant we have eaten at in 3 weeks. 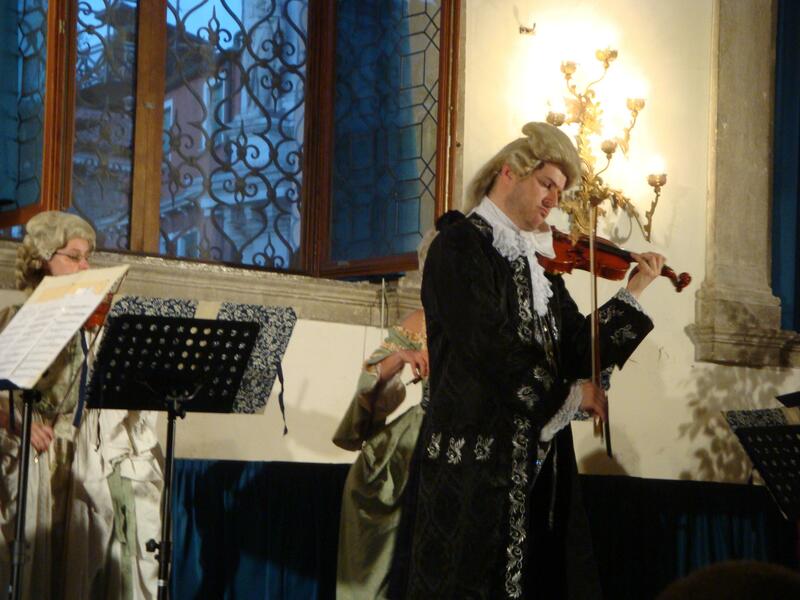 Another thing I wanted to do in Venice was to take in a Vivaldi Concert. 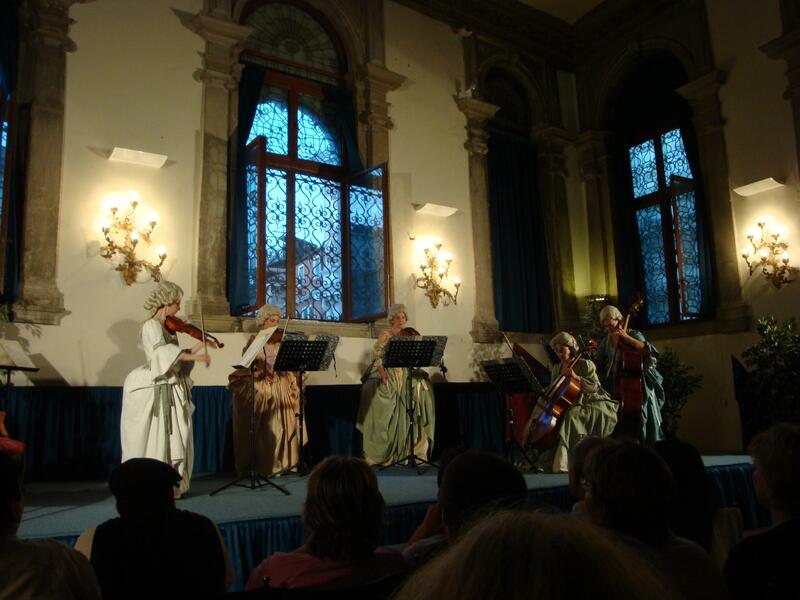 The Four Seasons was being played at Scuola Grande Di San Teodoro and the musicians were playing in period costumes. It was an excellent performance and for anyone that enjoys classical music, this was a treat. The cost was 35 Euro each for the better seats. 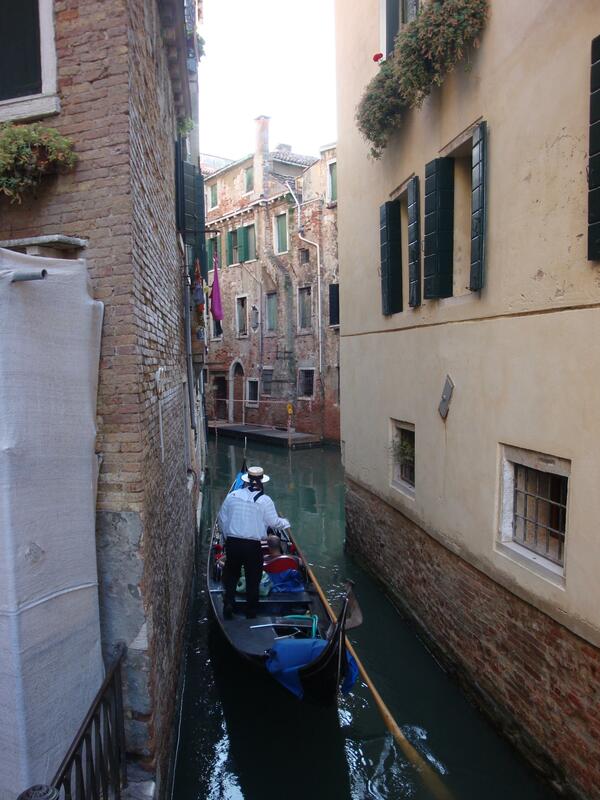 The saying…”bring half the luggage and twice the money” certainly rings true for our stay in Venice. A busy day today as we purchased a 12 hour Vaporetto pass because we wanted to see some of the other islands. Cost was about 16 Euro per person. 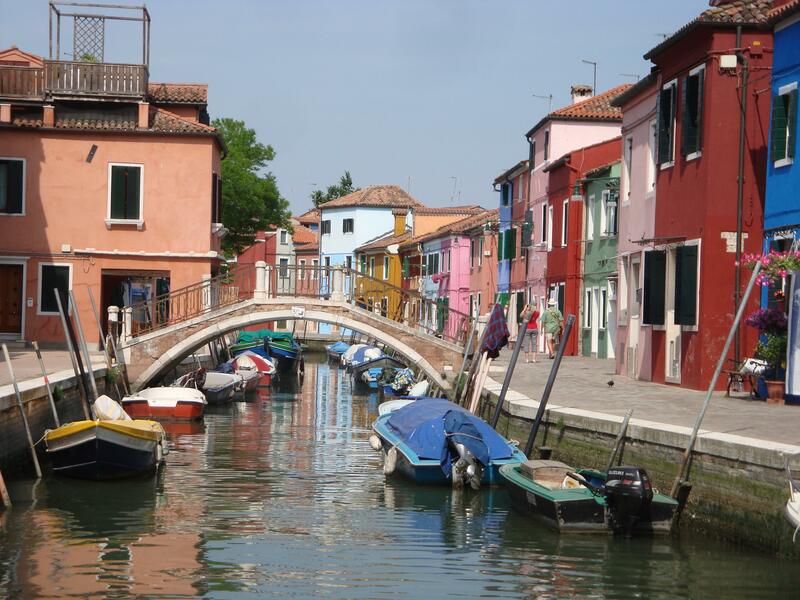 First stop – Murano, home of the famous Murano Glass Factories. 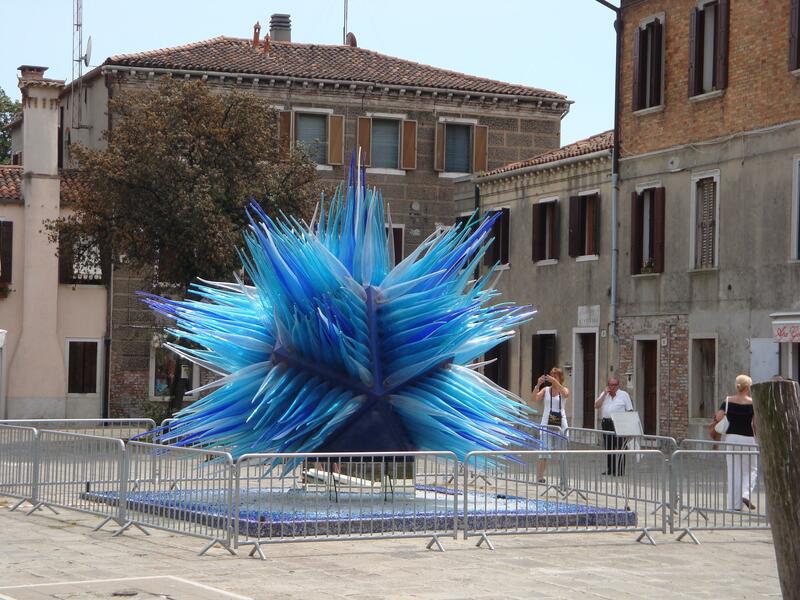 We wandered around town for a couple of hours visiting shops and shops of Murano Glass …it is truly amazing what they can do with glass from sculpture to necklaces and everything in between. A nice town but really has little to offer other than shopping. 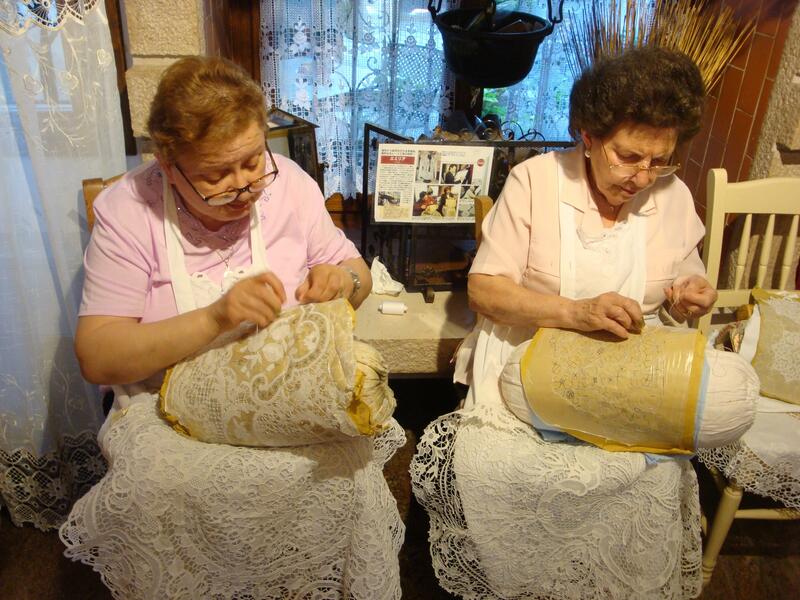 From there Karen dragged me to the island of Burano where they are famous for their hand-made lace. 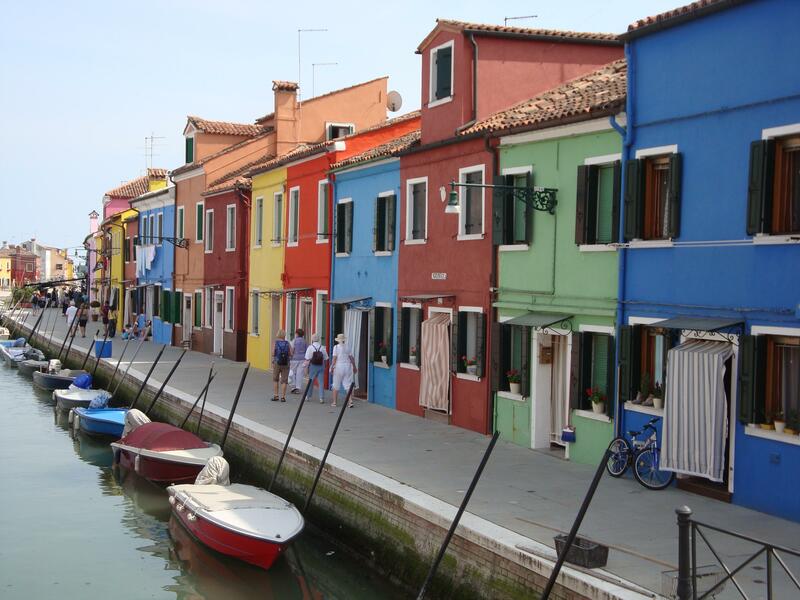 I was worried that the town would be nothing but shop after shop of lace and there are quite a few of those shops, but Burano is a very picturesque town of multi coloured buildings and we quite enjoyed the stop there. The vaporetto ride back to San Marco was about 75 minutes, so when we arrived back in Venice we simply grabbed another Vaporetto and headed off to the Jewish quarter, known as the Ghetto. There’s a bit of history to the area but not too much to see. So we continued our walk as far the next nice restaurant for a bite to eat and then a Vaporetto ride back to San Marco. Recommend that people try the ride at night as the view is quite different and very nice. 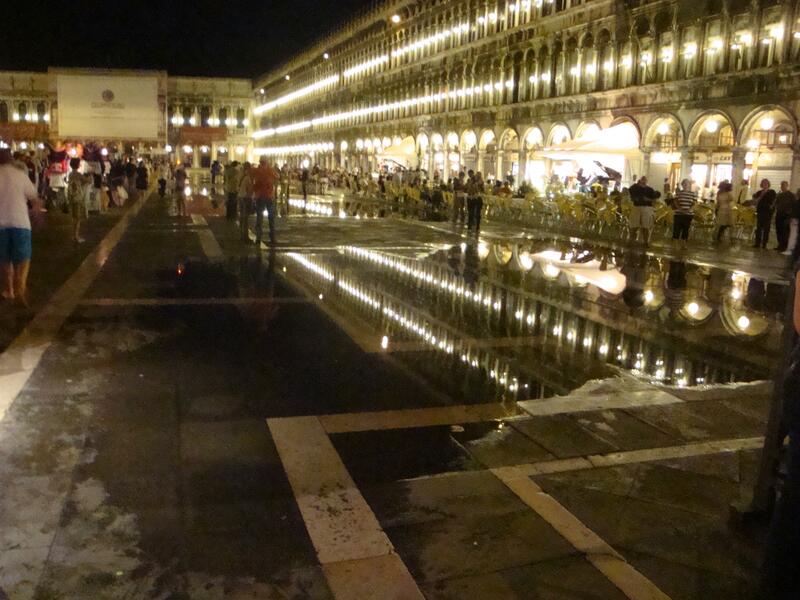 The tide is high tonight so when we got to Piazza San Marco, many areas are under water as the water tends to seep up through the stone and the drains when it’s high tide. Interesting. My feet hurt!! We must walked for 4-5 hours today, purposely getting lost and discovering nooks and crannies that allowed us to escape the crowds! 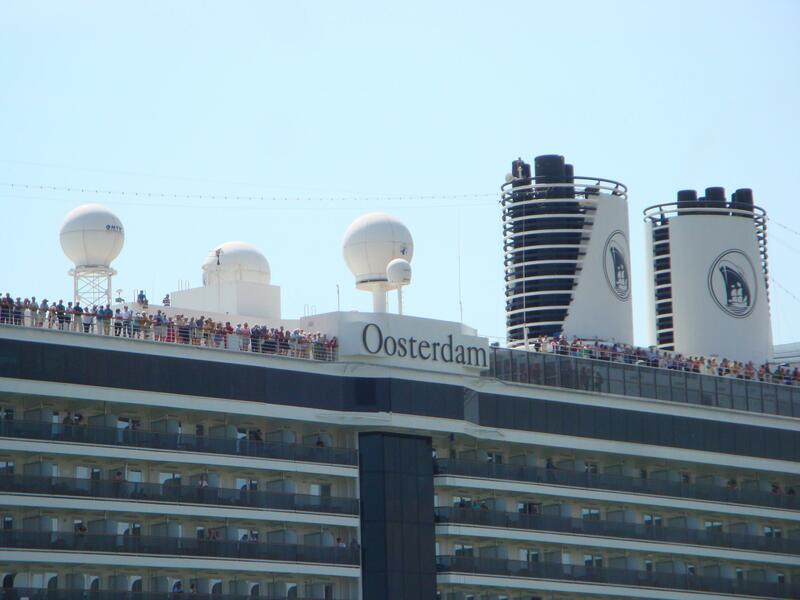 Holland America’s Oosterdam was in port today and could you ever tell. 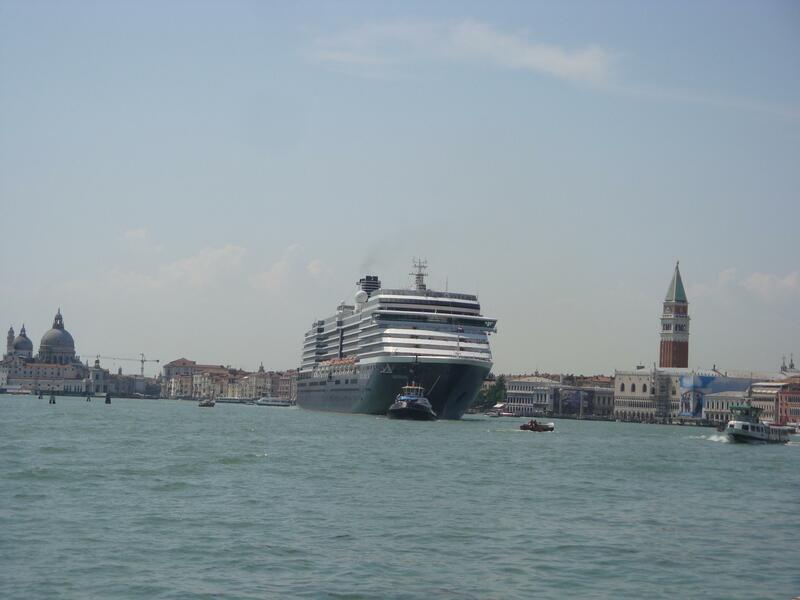 It’s funny to watch as cruise ships leave because I think they must all list to the port side as the passengers all gather to look at San Marco as they leave the port…see below. 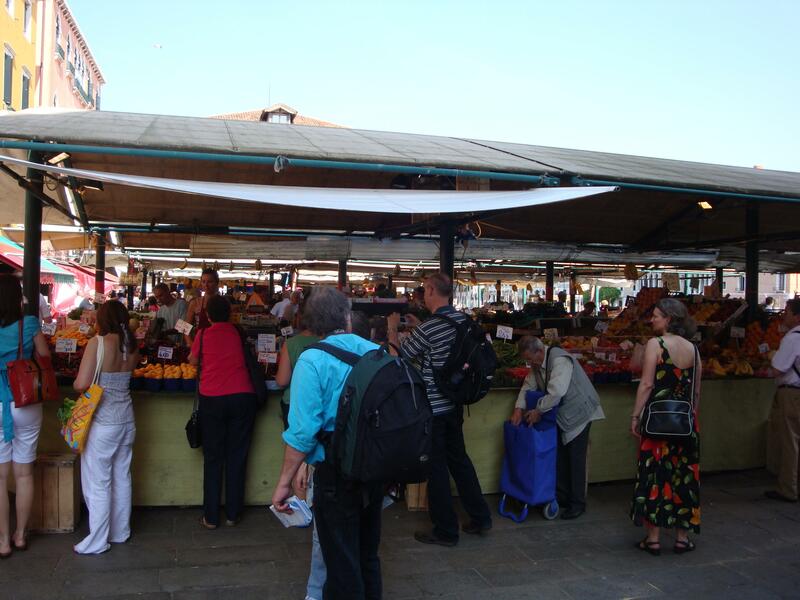 Anyway we started the day by visiting the Rialto market where we were looking for supper at home tonight. 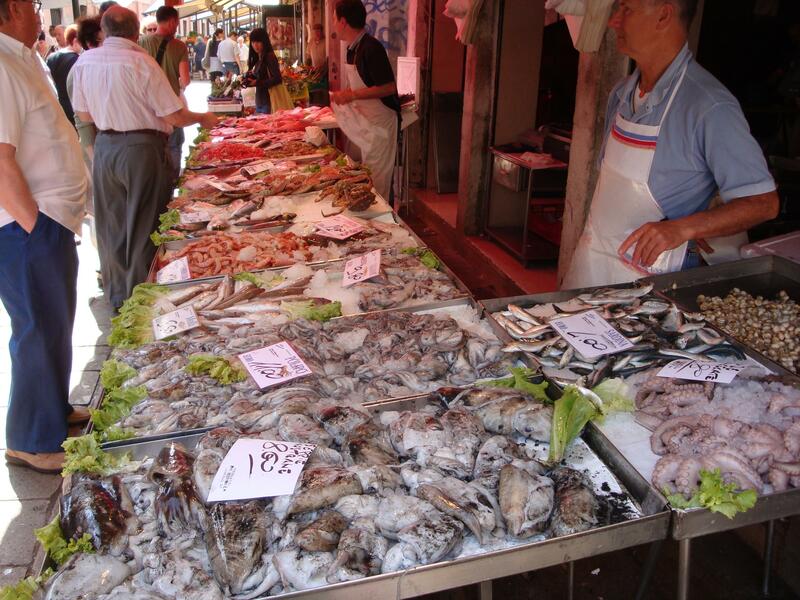 Great produce and lot’s of fish options. Karen agreed to cook a pasta dish and I agreed to cook a fish for dinner. 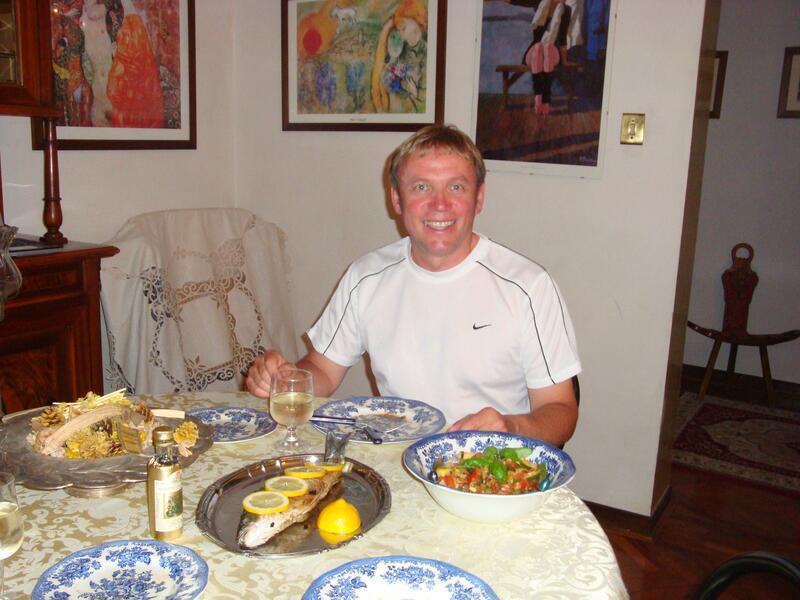 The fish choices were many and varied and included many choices that I have never seen before…they look so different fresh than when they arrive on your plate in a restaurant. Produce galore...many vendors like this. When all was said and done, Karen chose to make a spiral pasta with a tomato base sauce and the fish I chose was Brazino (Sea bass for all you non-Italians). 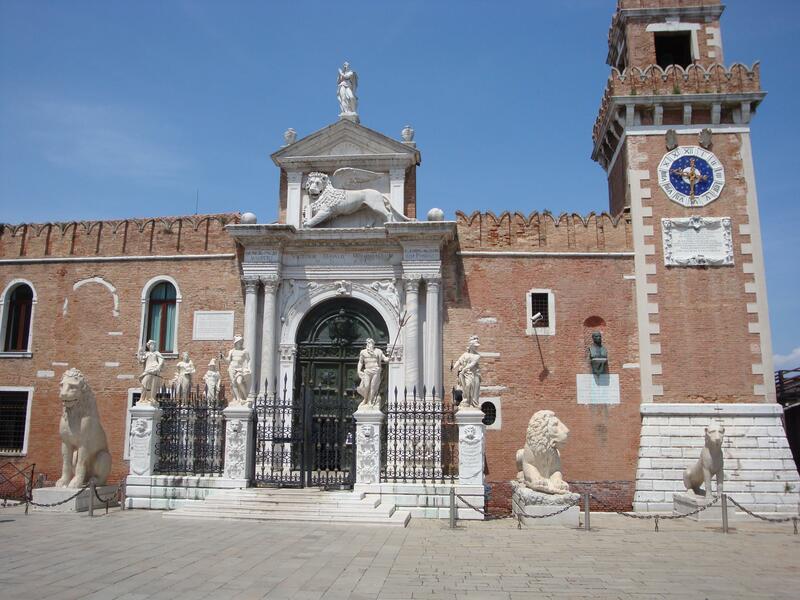 We dropped the groceries at the apartment and then went wandering and we ended by the Arsenale area of the city which was where they made and stored warships and other vessels. Found a great little place for lunch right on the square and rested for a while before continuing our goal of hiding from the tourists! We were wiped and so made our way back to the apartment to honour the age old practice of siesta! 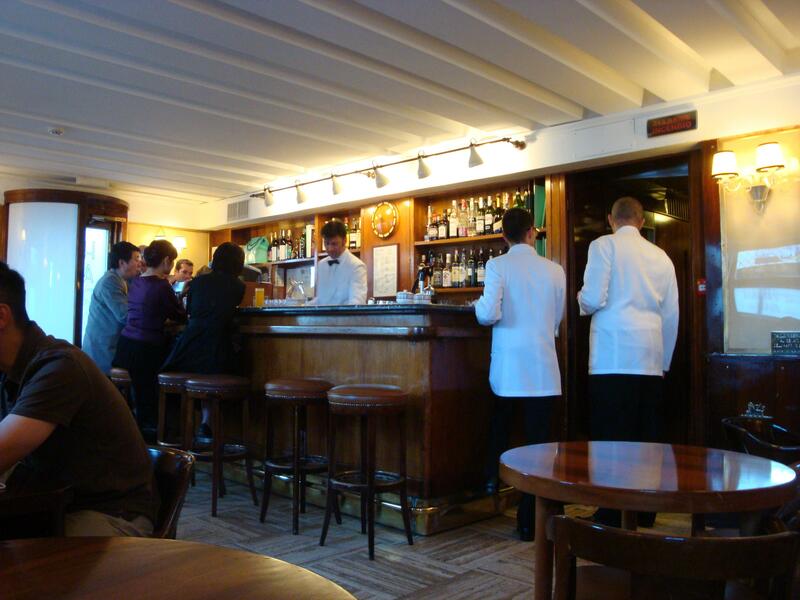 After our siesta, off to discover Harry’s Bar – home of the famous Bellini. Great drink of Prosecco and peach juice but Ernest Hemmingway would roll over in his grave if he found out they were charging 15 Euro per drink! Crazy and would not recommend anyone bother visiting Harry’s Bar. There are no pictures allowed, so here is my picture of Harry’s Bar. 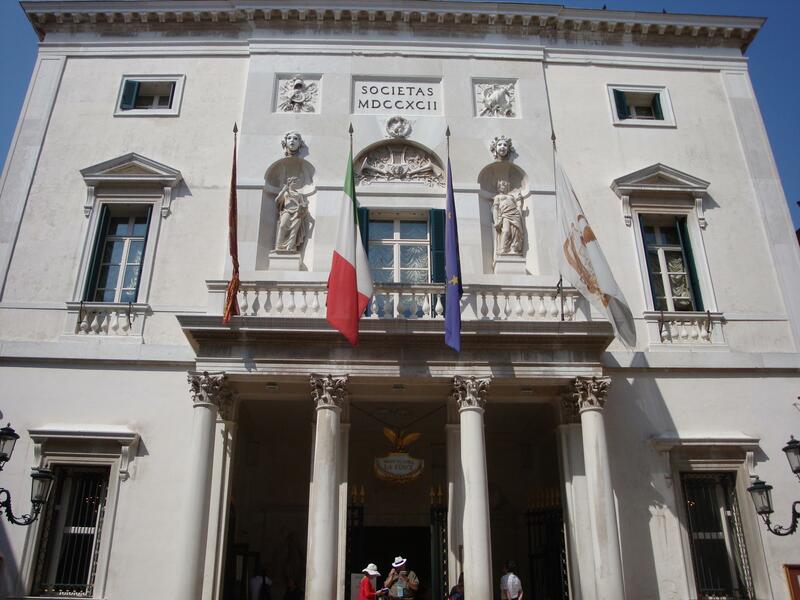 A little bit of walking before supper and we found ourselves in front of Gran Teatro la Fenice – a grand old opera that had a spectacular fire in the 90’s (I think) and has been rebuilt and is now open. 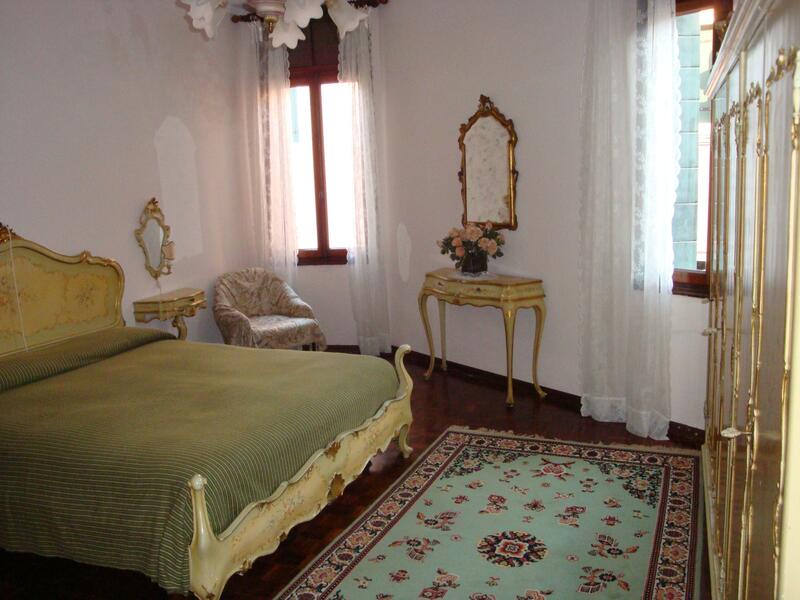 Enough sightseeing and home for a great home cooked meal (8:30PM- early in Venetian tradition) and a relaxing evening. 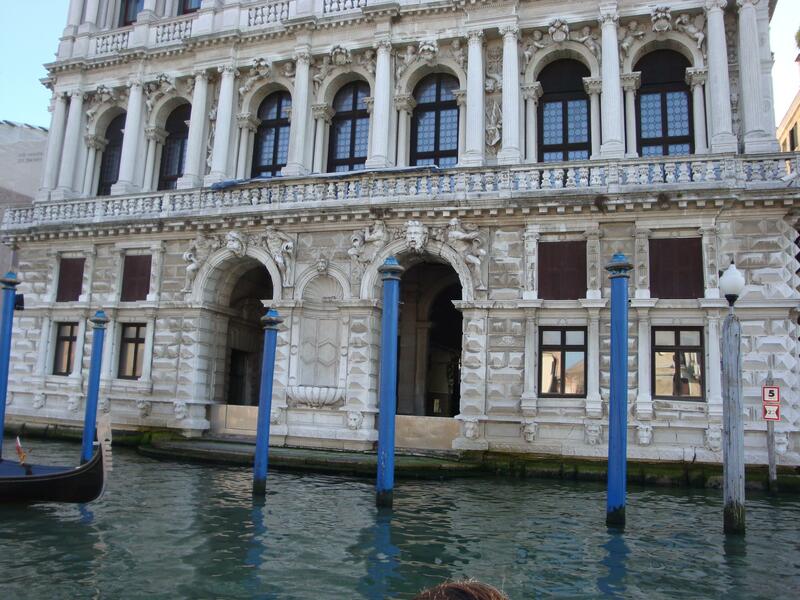 We had booked a tour on our website at www.uniglobevacation.com for our first day in Venice to get us oriented. The price was very attractive compared to trying to book the tour locally and it was well worth the money. 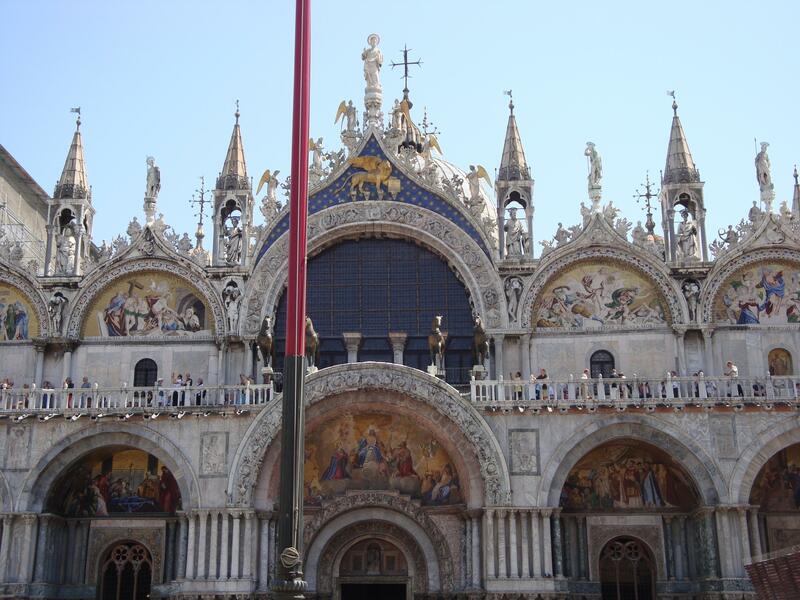 The first part of the tour was a walking tour including entrance into San Marco Basilica. She spent some time explaining the main sights around San Marco Piazza but then took us into some of the “roads” less travelled and explained life as a Venetian. We really enjoyed that perspective and a chance to get away from the crowds. If this is shoulder season, I would hate to see the tourists here during high season! 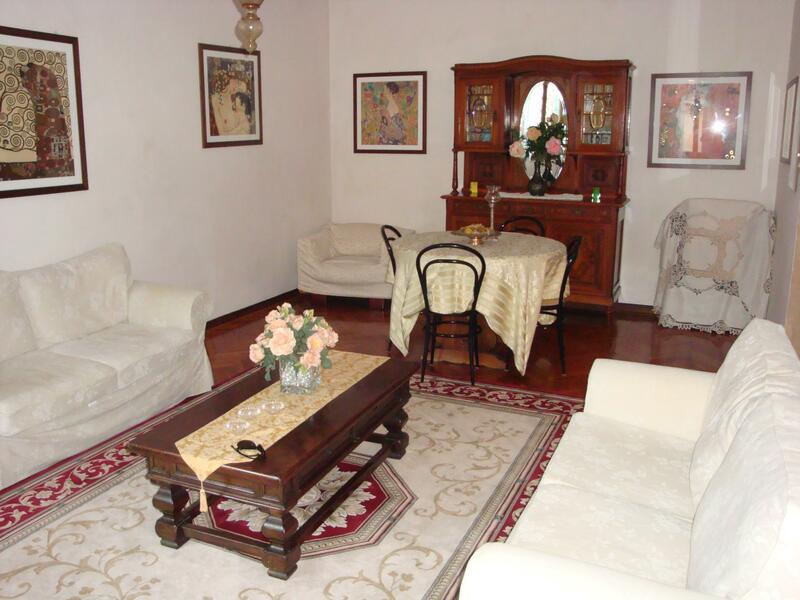 The tour guide finished the first part of the tour near Rialto but she had recommended a local restaurant called Zucca which is located in the Santa Croce area of Venice. Off we went to find ourselves lost a few times but hey, we actually found the place! Of course the menu was all in Italian but we got talking to the couple at the next table (from Oregon) and since they had researched the menu and had just eaten, we simply ordered what they had and it was excellent. We spent quite a bit of time there talking with them and getting other recommendations. 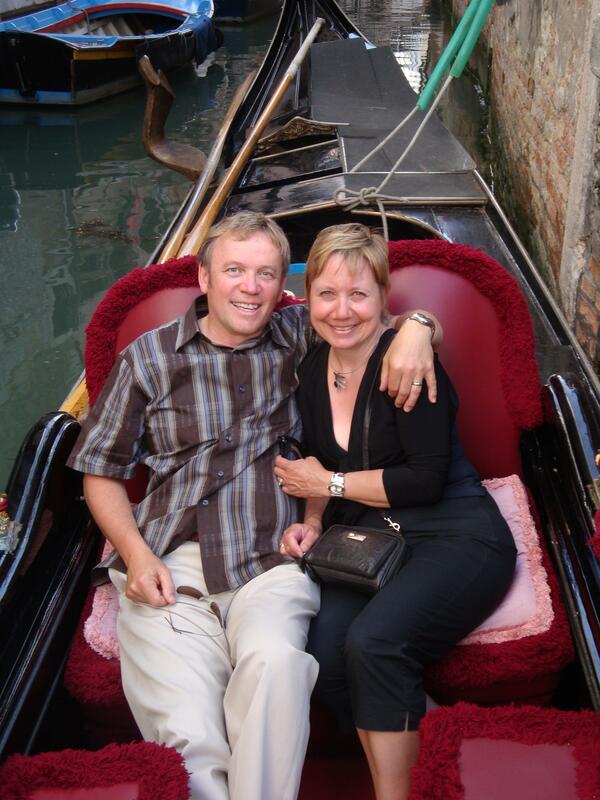 Finding our way home was somewhat easier and the second half of our tour was a boat excursion on the Grand Canal. Again, the tour guide was excellent and she explained many of the buildings to us as we sipped on a complimentary glass of Prosecco. 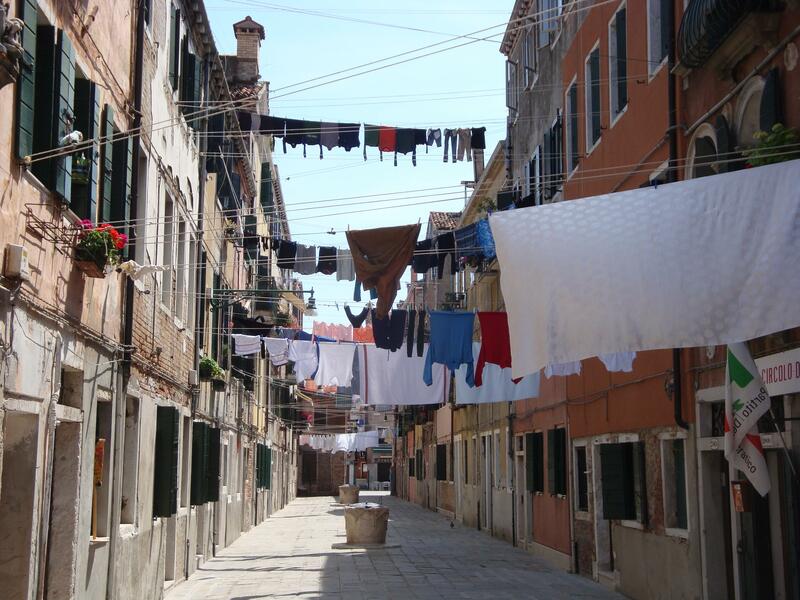 After the tour, off we went to explore more of the side streets of Venice and managed not to get too lost. An early start as Don and Dianne drive us to Sorrento to pick up a train to Venezia. 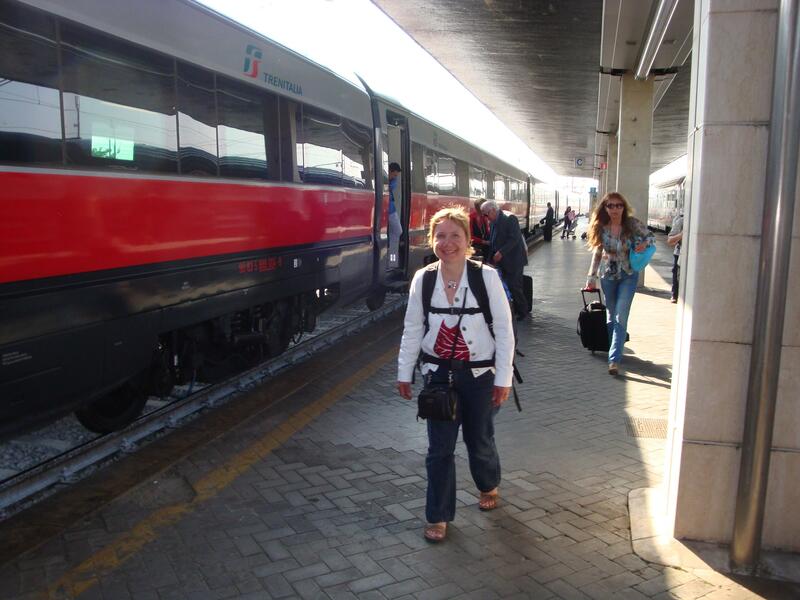 With our luggage, travelling by train is a bit more challenging but is relatively simple. We had to change trains in Napoli but we had an hour and twenty minutes. It wasn’t until we were boarding the train in Naples that I realized I had left my leather jacket on the last train…crap! Oh well, I hope the next owner enjoys the jacket as much as I did. The train transfer in Rome was a bit tight as our arrival time there was a bit late. We had 20 minutes and we managed OK. I was a bit concerned so I decided we would get on the train in car 9 but our seats were in car 3. Not the best thing to do…dragging your luggage and backpacks through 6 cars, but we made it. 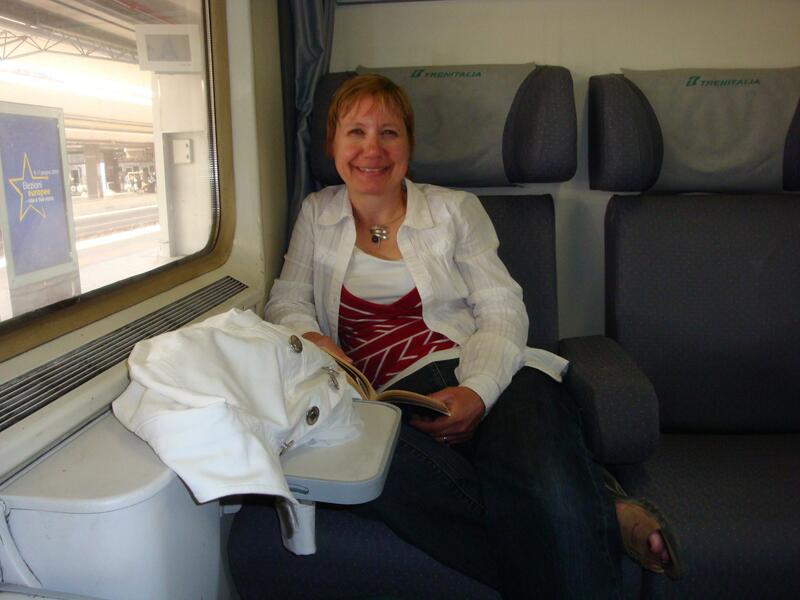 The train from Rome was very nice including a dining car where we had lunch. Good lunch, albeit it quite expensive. We paid about 38 Euro plus gratuity for a plate of Risotto, a plate of Italian salami’s and cheeses, Tomato/mozerella salad, coffee and a bottle of water. Arrival in Venice was easy with the train station in S.Lucia. 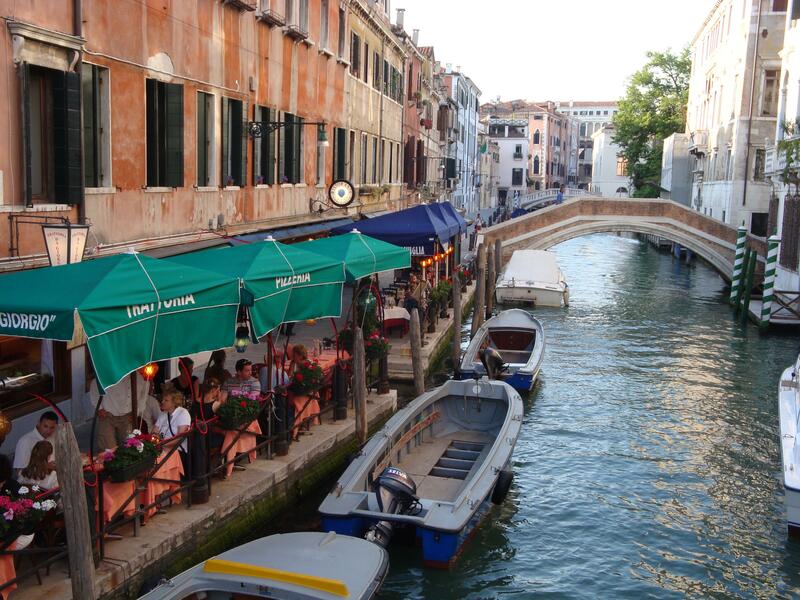 The Vaporetto station is right outside the station…you just need to know which vaporetto to get on. We were told line 1 or 2 and we ended up taking line 2. Unfortunately, this line did not go to the vaporetto station we needed to go to and so we had to walk a couple of “blocks” to the right station where we were being met. A bit cumbersome up and down a couple of canal bridges but we managed. The lady meeting us walked us to our apartment and then up the 42 stairs to the apartment. 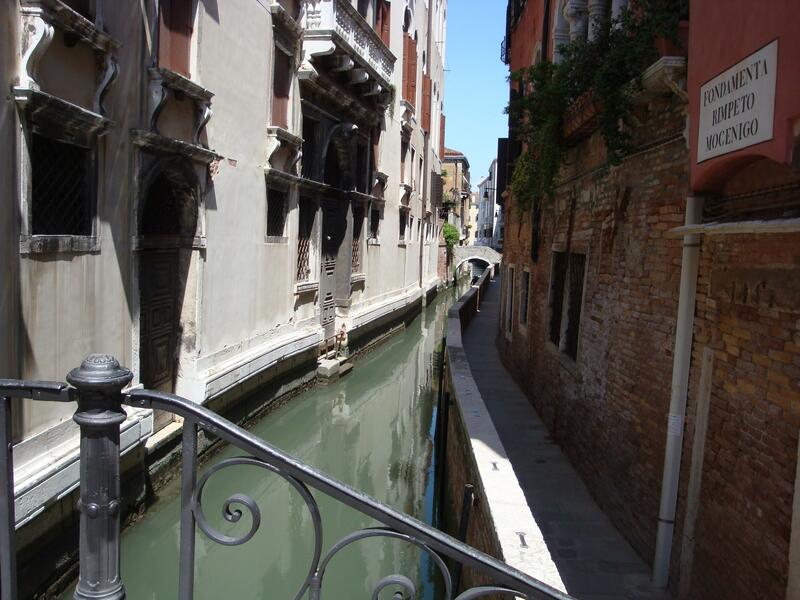 A tip – bring minimal luggage…it is just a pain trying to get through Venice and up inevitable stairs with lots of luggage and we thought we had really trimmed it down. The apartment is very nice and rather than include too many pictures, if interested you can check it out on their website at www.ladysanmarco.com. 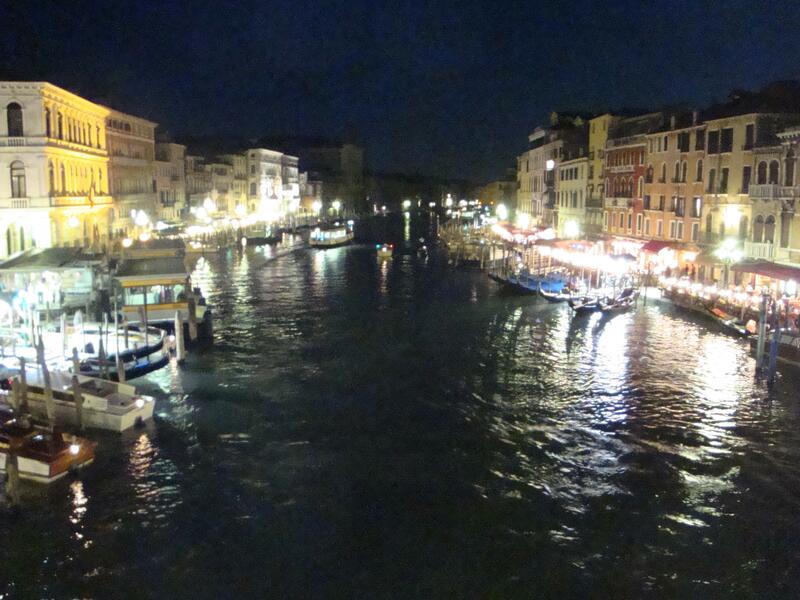 A quick trip to the Rialto Bridge for dinner (expect to pay more to eat on the Canal) and a little sightseeing. Of course we got lost coming back to the apartment and had to ask a couple of times for directions. This is to be expected in Venice as the streets are very confusing and the printing on our map is quite small and hard to read in the dark. Looking forward to more of these adventures!